Day in, day out, I walk and ride my bike past the yellow double-decker bus in Braddon. I don’t know what it’s doing there. I do know that it’s a Leyland Titan, OPD2. Probably made in the 1940s or 50s. Ex-NSW Department of Government Transport, fleet number 2721. I know that in 1975 it was registered to a G. Kyan Kuang of Downer. I know that G was for George, and that George used it as food van. Burmese food, hence Mandalay. I don’t know what happened to George, or his business. I never ate at the Mandalay van. My late night eats were at Dollys and The Doghouse – more standard joints in both fare and appearance. I haven’t ever seen the yellow bus anywhere in Canberra other than where it sits now, hulking up one end of a rough hewn park-side car park. I don’t even remember the first time I saw it – it just seems it has always been there, part of the Braddon landscape. For a long time the yellow and purple bus was the only blip of colour and character in a tired work-hardy part of town, flanked by petrol stations and brick box buildings. Then, as in now, she had a certain eclectic exoticism, being the Burmese themed British built bus that she is. In the fabled eras of free love many Leylands were converted to campervans, and for the more imaginative among us this tired bus, stranded though she is, still wears that potential. She stands for adventure. She stands for late nights and early mornings. She stands for a Canberra where you could actually do something like operate a food van out of a car park. She stands for a time in life when hanging out in a car park with your friends is as good a night out as any. As Braddon is reinvented the bus has become part of the decor. The sides are plastered with stencils, graffiti, tags and paste-ups, her leviathan-like presence exaggerated by the addition of a singe large and soulful eye. Newcastle artist Trevor Dickinson illustrated her and these additions in his 2012 Canberra series – the yellow bus immortalised as a landmark and cultural object as significant to him as Parliament House or our bizarre rotund bus shelters. Also in 2012 the master plan for Haig Park (the strange and ill-reputed belt of trees that runs through Braddon) made specific reference to the Mandalay bus, using the word ‘unsightly’ and pushing for its removal. Recent activity at the bus by men with utes and hi-vis vests makes me think this removal is imminent. I am illogically despondent about this likelihood, and frustrated by my own debilitating nostalgia. Worrying about an old bus is a time and energy consuming preoccupation (see this post), but what is it exactly that I want? For the bus to get a new paint job and carry on where it left off? For it to stand exposed in a car park until the end of time or its shell rusts through, whatever comes first? Perhaps I want to know what makes something ‘unsightly’, who gets to make that call, and why? And maybe I’m confused as to why a much-loved landmark – an object heavy with stories and memories so intrinsically Canberran – can be dismissed as refuse by one hand of government while the other tries to find things to call our own, commissions new objects and creates new sites to wear veils of significance. Mostly I just want more time with the bus. God I wish I didn’t care about such things. Photo at top of post is thanks to Andrew at Life In Canberra. 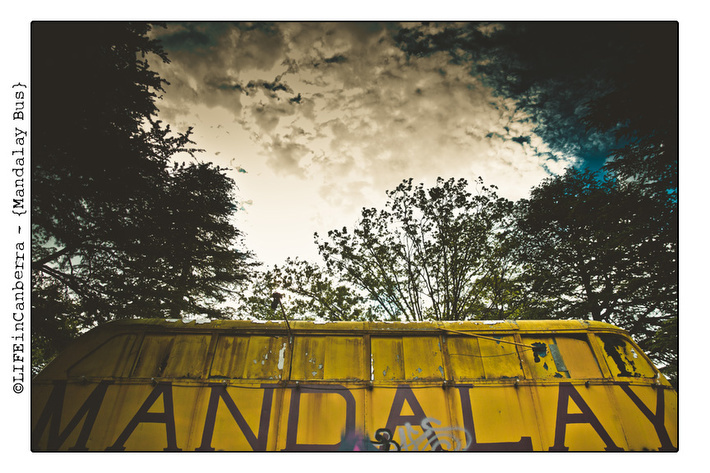 Check out the other beautiful images of the bus on his blog. 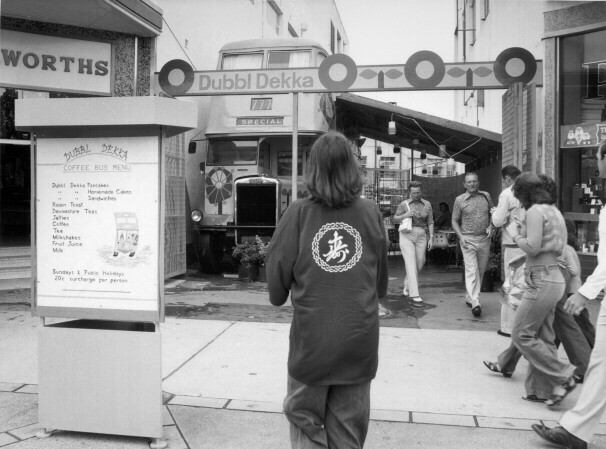 In my search for more info I’ve also found this image on the ACT Heritage Library of the ‘Dubbl Dekka’ cafe in Civic, taken during the 70s. Could be the same bus perhaps, prior to its accquisition by George. Unless this town is big enough for two Leylands. Please let me know if you have any info. EDIT: Only a week after I posted this we heard that the bus is now being given a new lease on life – check out this great story from the Canberra Times. Love this post Yolande. Being of a certain age I recollect that Dubbl Dekka bus in Civic but can’t answer your question re its relationship if any to Mandalay. I don’t go to Civic much except to the Dendy but I have seen Mandalay and loved that it was there. Very different but also like the Tent Embassy, if I dare say that. I love the fact that we have these “untidy” places in Canberra to belie our reputation as boring, clean, soulless. The Tent Embassy is of course in a whole different ballpark in terms of importance but you get my drift I’m sure. Mandalay could go to CMAG but that wouldn’t be the same would it. I’m thinking much these days about museums and what they mean what we want… and now I must go as other duties call. It’s actually reopen ing! The owner had to give it when he was punched up and lost an eye but they are setting it up for business again! The bus is being revamped and launched again to honour George who still lives in canberra, by his sons stewart, and phillip and daughter winwin with help from andrew hollands of soju girl and ellacure and will up and running in the near future, and will provide a brand new food experience in canberra and hope all those who love this canberra icon get out there and show their support to these guys and ensure the bus stays the icon we love and know. I wish Good luck to all those involved.